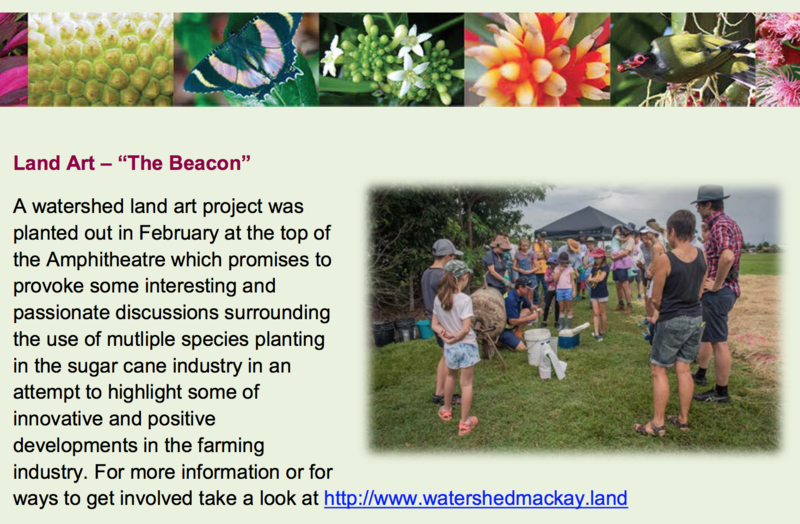 A brief update: our project is featured in the March 2018 edition of the Mackay Regional Botanic Gardens Newsletter, along with a range of other great stuff happening at the gardens. 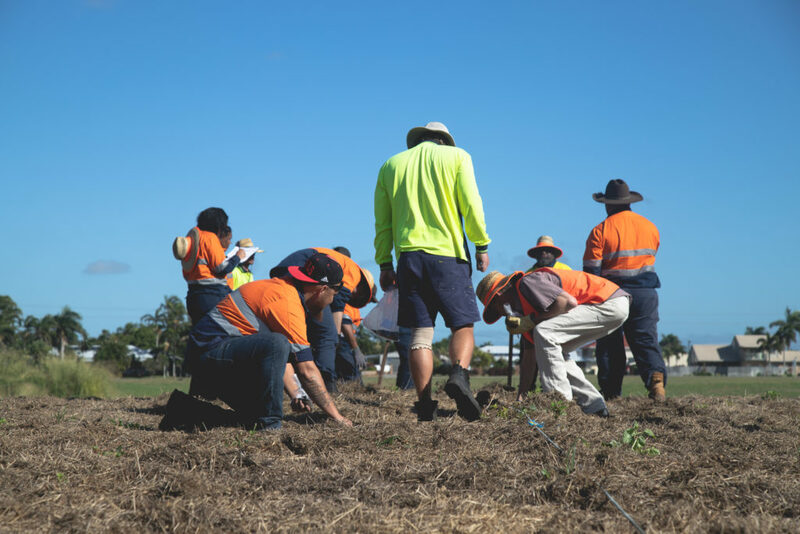 The Beacon Legume Planting Day was a success! The rains held off until 11am, which gave us enough time to make a great start. 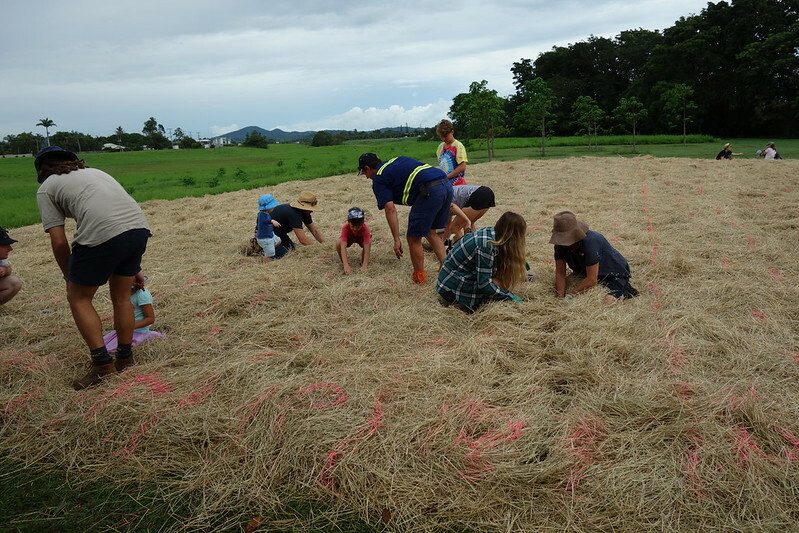 We had 27 people along as participants – just the right amount to make a critical mass, not too many to be unmanageable. 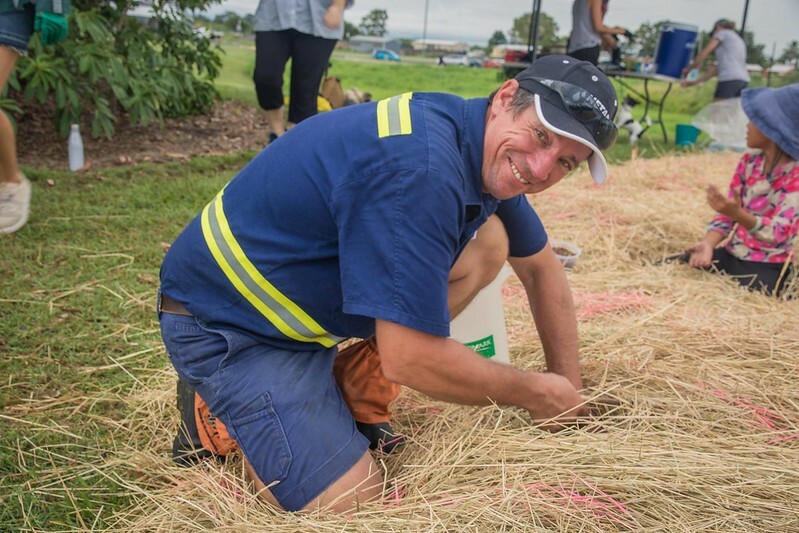 Philip Kemp from the Yuwibara Aboriginal Corporation came down to be part of it, and there were people from Mackay Council who work in arts and sustainability, Katie from Great Barrier Reef Marine Park Authority, Mel from Pioneer Catchments and Landcare, and of course all our key players including Starrett from MADASSIA, Kellie our education expert, and farmer Simon. Oh, and Councillor Laurence Bonaventura, who has been a great supporter of our work since last year’s Sunset Symphony in the Sunflowers. 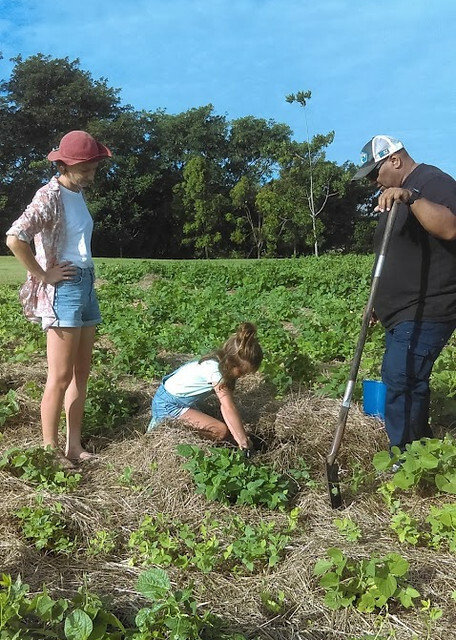 Charmaine Miller had done an interview with us on radio my105.9, and she came along with her son. 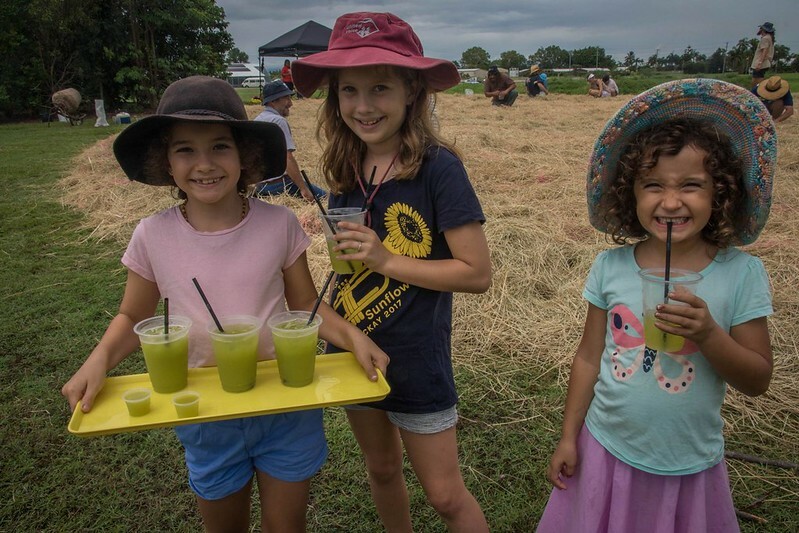 And we were graced by a bunch of lovely cheeky kids of all ages too. 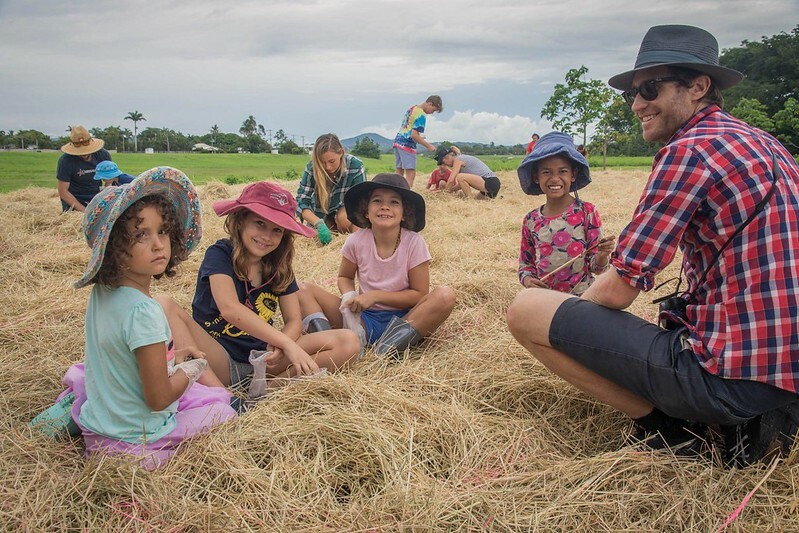 We started off with an acknowledgement of country, followed by a short update on the who what when where and why of our overall art+farming project. 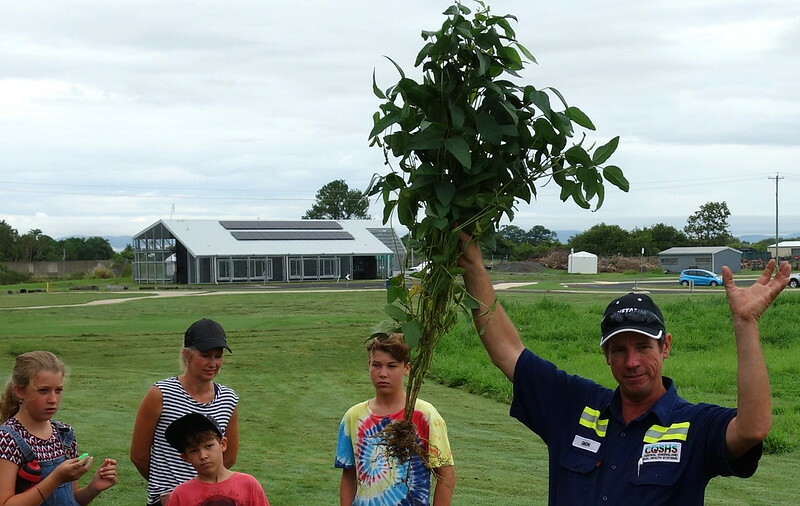 Simon Mattsson explained the biological significance of planting legumes (in a nutshell, legumes fix nitrogen in the soil and improve the soil biology to give our future crop of sunflowers and sugarcane a better start). 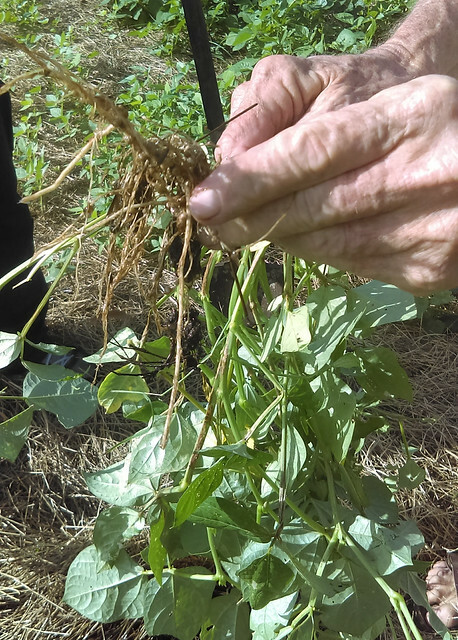 He brought along a mature soyabean plant from his farm to show the nodules that form on the roots. Then Kim, Sophie and I pickup up our ukuleles and led the crowd in a rendition of “The Legume Song”. 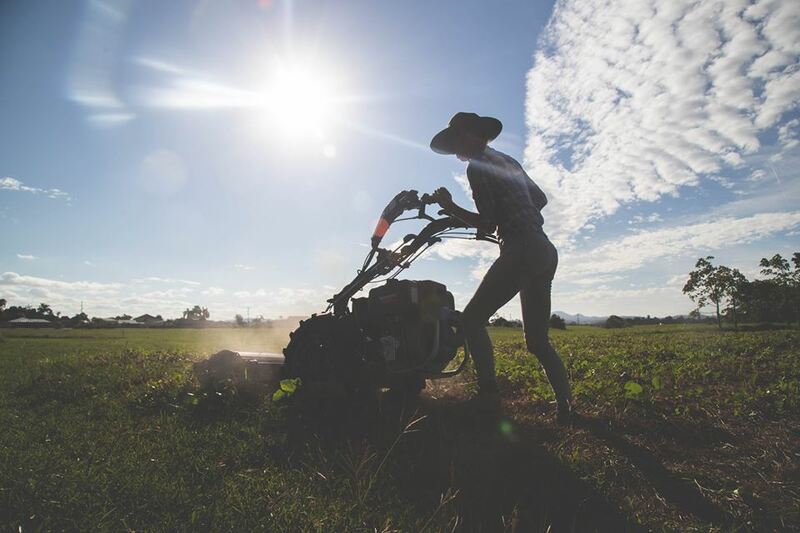 The tune is based on a sugarcane planting song from Barbados, which Kim adapted with new lyrics to local conditions! 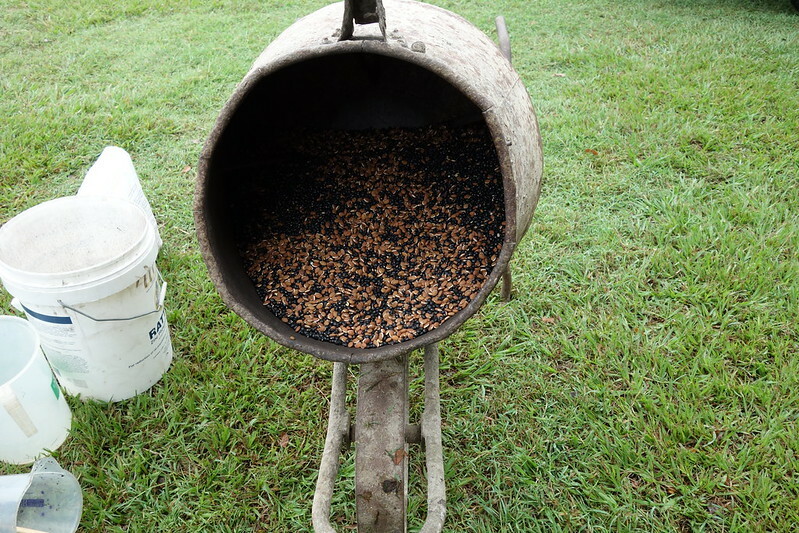 After this, Simon demonstrated the use of “innoculants” to help the legume seeds along. Some of us were more higgledy piggledy than others, so it will be interesting to see what patterns the seedlings produce when they emerge! 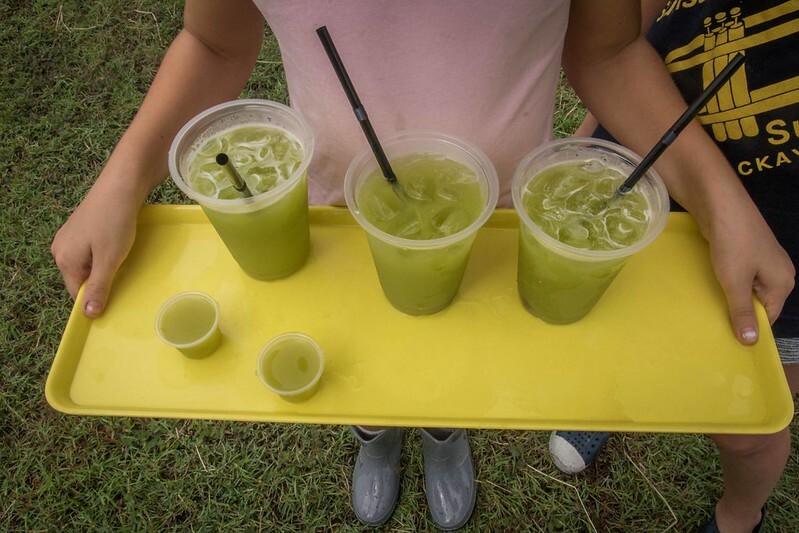 After an hour we had a break for some delicious sugarcane juice provided by Sugar Rush – a local business just starting out. 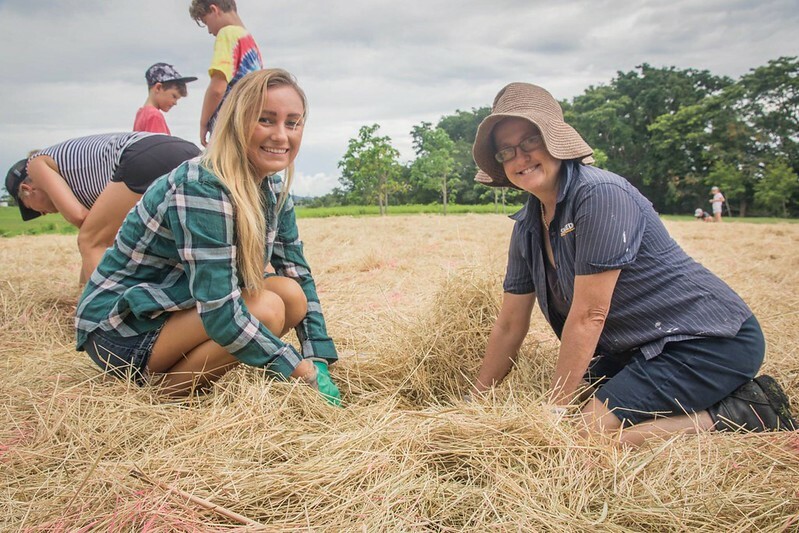 It was terrific to work with Karl from Sugar Rush – Simon and Luke provided the cane freshly harvested from the farm in Marian. And Susie made some excellent home baked scones for our morning tea which disappeared almost instantly. 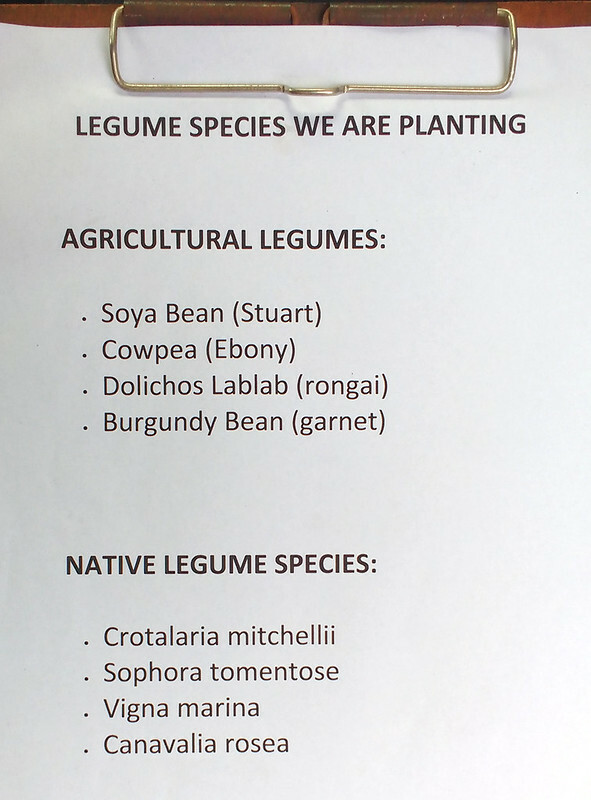 We were pleased to get so many legumes into the soil, although we didn’t quite finish the job. 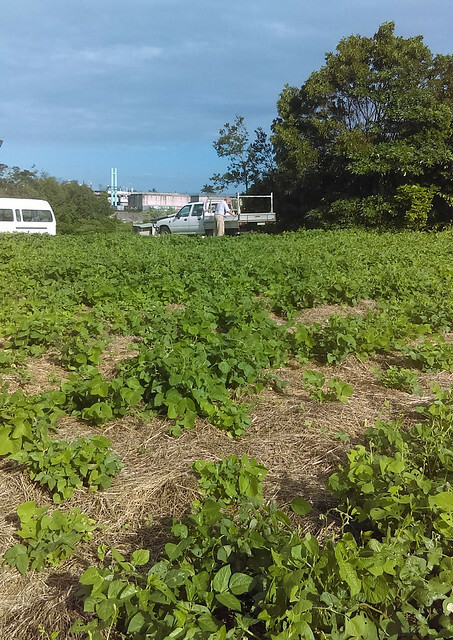 That honour was saved for Starrett’s crew who planted out the rest of the legumes on Monday morning. Now we wait and see what happens! 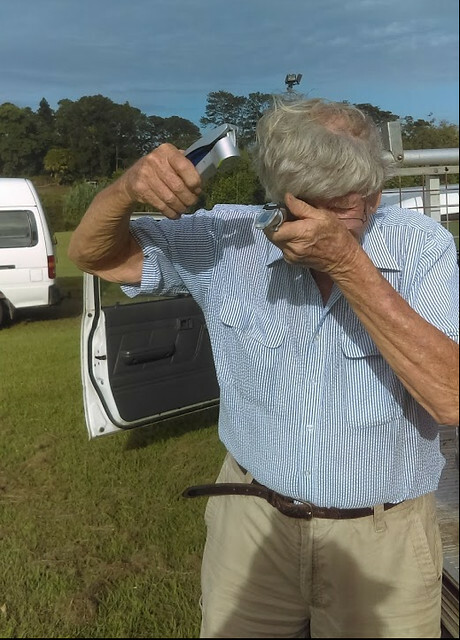 The second was a radio interview with Charmaine Miller, on my105.9 radio, which is run by the Mackay and District Aboriginal and Islander Media Association. It was a full house in the studio with Kim, Lucas, Starrett and Simon, all talking about working together on the Land Art Project at the Botanic Gardens and discussing why we’re involved from our diverse backgrounds and professions. 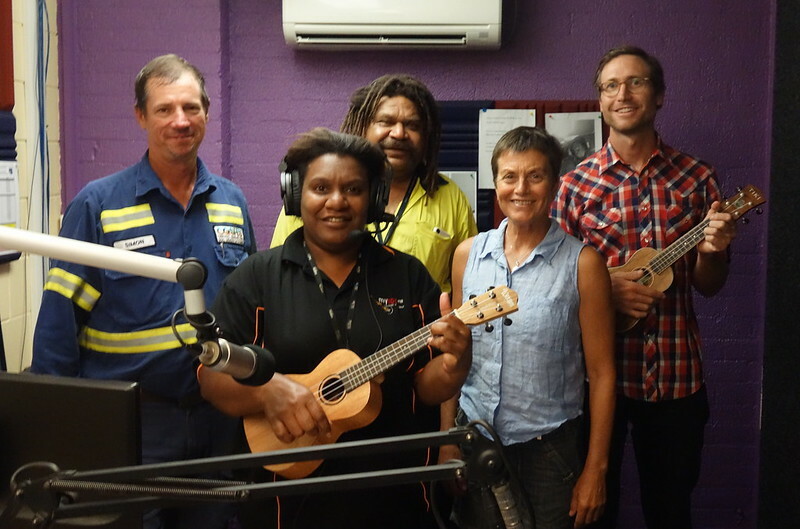 Kim and I brought our ukuleles along, and everyone sang “The Legume Song” on the air – a “world premiere” – which was a thrill. (if you want to listen to the song on its own, click here). 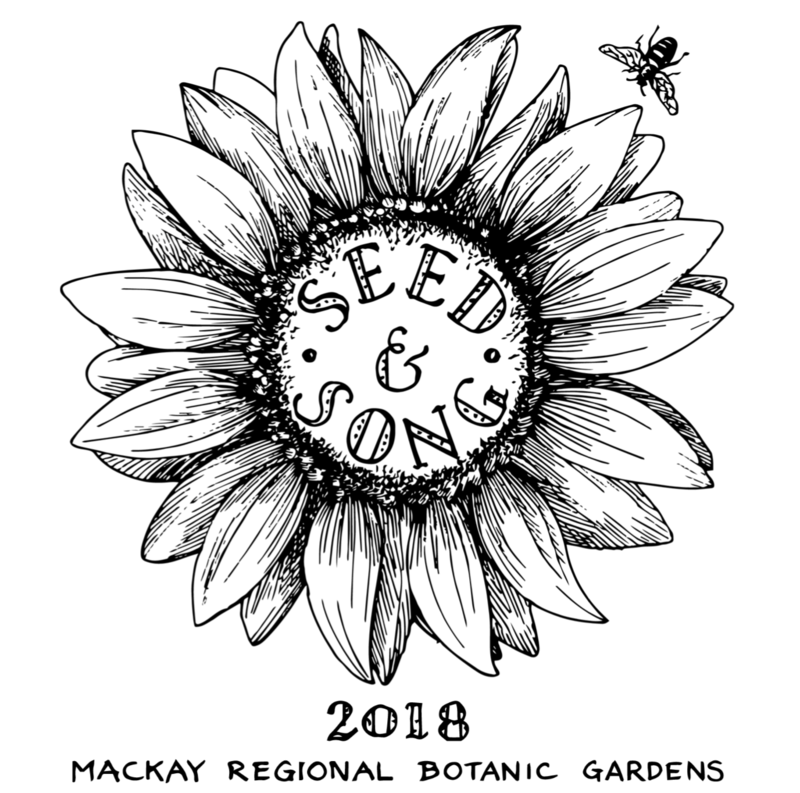 Mackay Regional Botanic Gardens hosts unique Land Art Project. 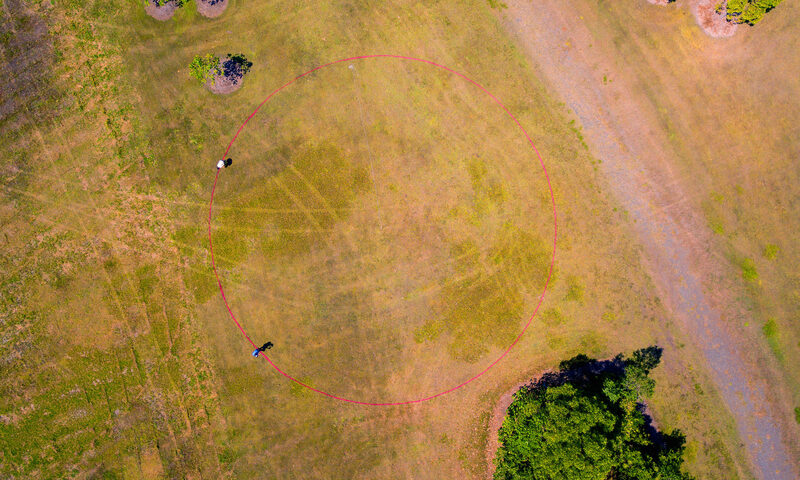 A unique work of land art is being launched in Mackay this week. 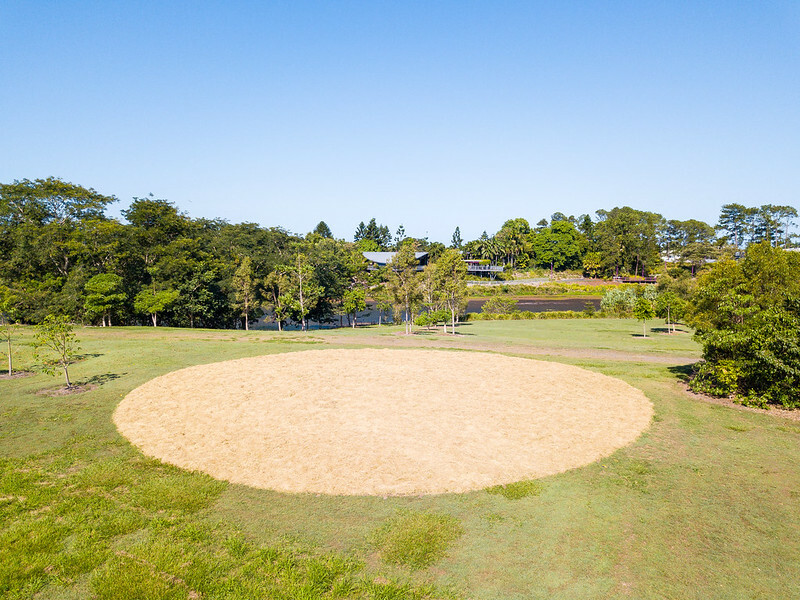 Watershed: The Mackay Regional Botanic Gardens Land Art Project is the creation of Wollongong artists Lucas Ihlein and Kim Williams, in collaboration with a host of local farmers and community organisations. 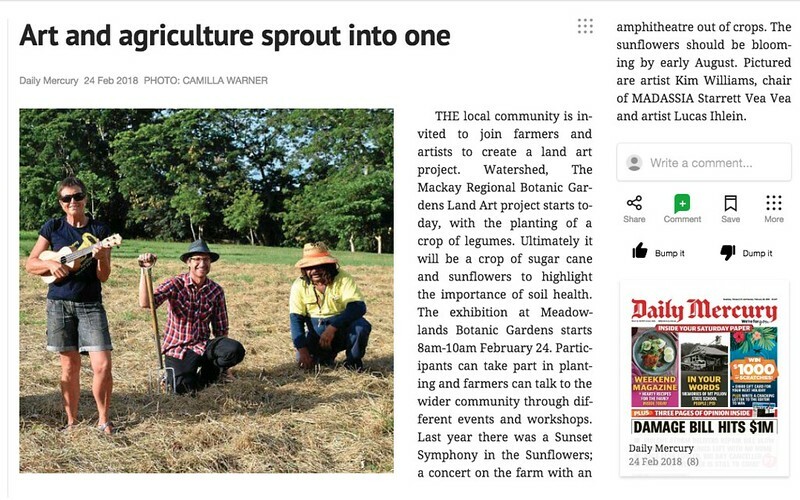 The project involves the planting of a dual crop of sugarcane and sunflowers on the Meadowlands at the Botanic Gardens. 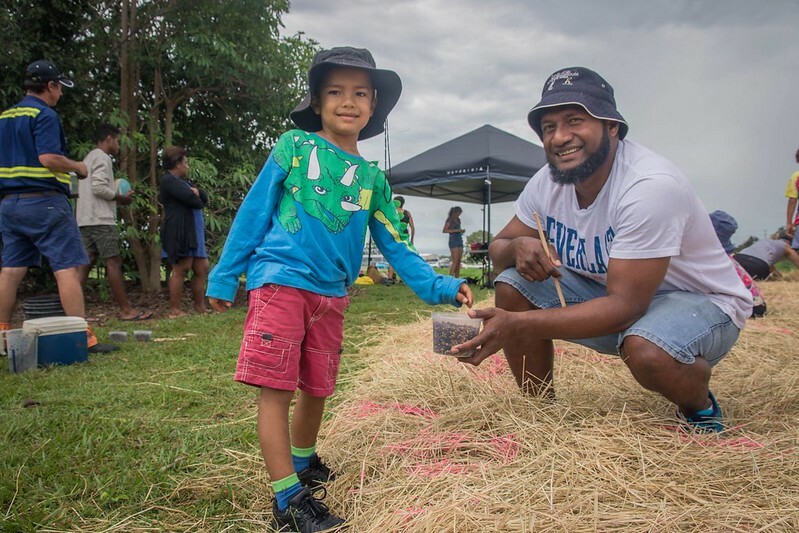 The artists hope to raise awareness about the importance of soil health in agriculture, bringing farmers into dialogue with the wider community through events and workshops. 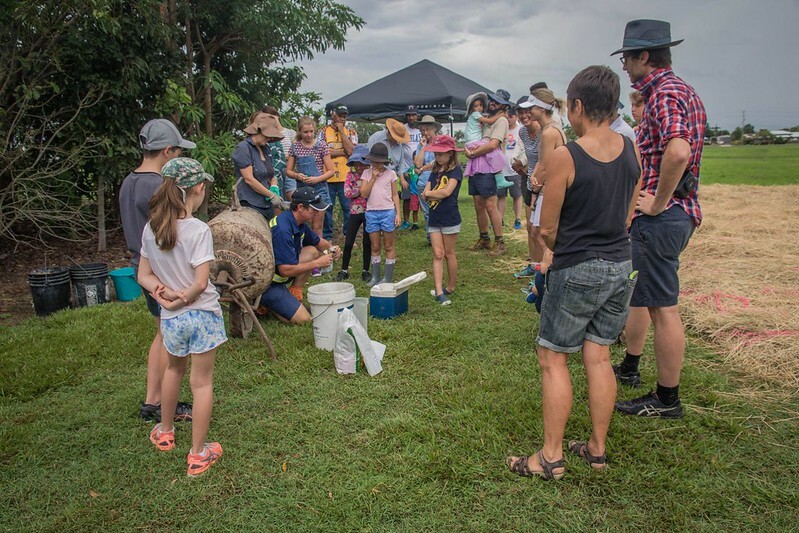 Some of the key collaborators in the project include Mackay & District Australian South Sea Islander Association (MADASSIA), Yuwibara Aboriginal Corporation, Central Queensland Soil Health Systems, and the Great Barrier Reef Marine Park Authority (GBRMPA), Artspace Mackay, and Reef Catchments. On Saturday 24th February from 8am-10am, the public is invited to join the artists to celebrate the commencement of the project. 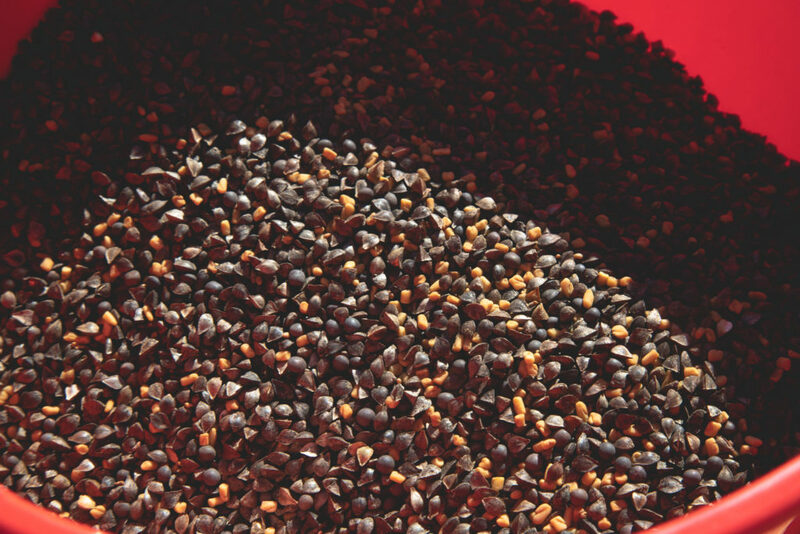 Participants are invited to take part in the planting of a crop of legumes which will help to build nitrogen in the soil. View or download a PDF flyer for the event here.